Marching first in Linn Mar in pouring rain and then in soggy wool uniforms in Pella, the 96 member Ankeny High School Marching Band nevertheless performed their 2013 show “To a New Beginning” on September 28, 2013 with precision and style. The show features selections from “Les Miserables” with a French Revolution theme, including Color Guard in peasant dresses and carrying “sickles” as well as flags of “bleu-blanc-rouge”. 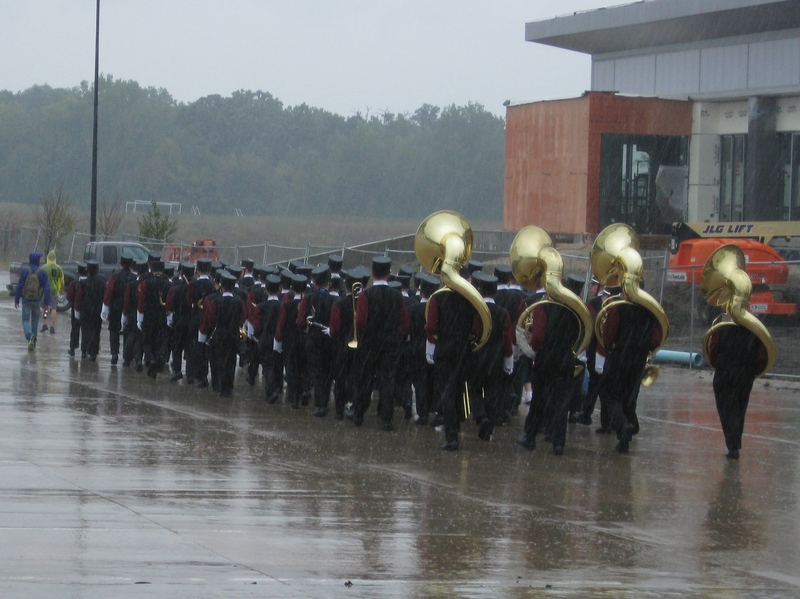 Undaunted by the miserable weather, the band and guard performed a dramatic show and earned 4A first place in Pella and 3rd place in LinnMar. The Color Guard was named “Top Color Guard” in both LinnMar and Pella. A crowd favorite is the 3rd movement “Master of the House”, in which guard and marching band ham it up (all the while playing their instruments and tossing flags). The show comes to a dramatic conclusion in the 4th movement with building of a barricade at the top of which is waved a giant flag of the French Revolution. The band and guard are directed by Joel Poppen and Jennifer Williams of Ankeny High School, assisted by Christian Baughman, Nate Newhard, Pam Hayden, Darin Mell and Jeff Norton. Drum majors are seniors Erin Miller, Luke Sanders and Noah Pick.